Big Daddy Wilson was born less than 50 years ago in a small town called Edenton, North Carolina. The population of Edenton counts less than 6000, 55% African Americans, 25% below the poverty line. “We were very poor but I had a very beautiful childhood“, Wilson remembers. “Me and my sisters were raised by Mom and Grandma. We lived a simple life, we went to church every Sunday, school on weekdays. I also worked back then on the tobacco plantation and in the cotton fields, I was a real country boy". Wilson sang in church but he never thought about going on stage. “I was extremely shy". His guardians meant well for the fatherless boy and they often sent him to church also during the week. “That won´t hurt him, keeps little Wilson away from drugs and off the streets". Young Wilson quit school at 16, and sometime later joined the US Army. Being a poor black man in the south and living in a small town, jobs were scarce. After being stations in Germany, the young man became homesick. “I found out the quickest way to go back home was to see that you got married. They’ll allow you a vacation time about two weeks to go home to get married. Wilson convinced his officers of his impending wedding and returned Stateside, refusing to return to Germany. After six weeks his mom was so worried that she begged him to go back to the military". And so I was back in Germany". A few years later Wilson met a German girl who became his wife. She is the reason for him staying and also the reason for a poem which became Wilson´s first song. And then Wilson heard the blues for the first time. Back in Edenton he had listened to music only in church and from the local, country radio station. But now he went for the first time to a real blues concert. “I met the blues here in Germany. I didn’t know what the blues was before" Big Daddy Wilson says. “It was here that I found a part of me that was missing for so long in my life". It did not take long and the shy guy who had written some poems started looking for melodies. He went on stage, jammed all over the German blues scene and made an impression with his warm and soulful voice. He began touring with bands and as a duo and even released a few records. “My sister came all the way to see me perform and she couldn’t believe it. No, that’s not my brother. It seems like all my shyness was gone – thanks to my music". Champion Jack Dupree, Louisiana Red, Eddie Boyd... many musicians who made Europe their home and brought the blues with them succeeded here better than in the U.S. Even Luther Allison lived in Europe for 14 years before his big break. 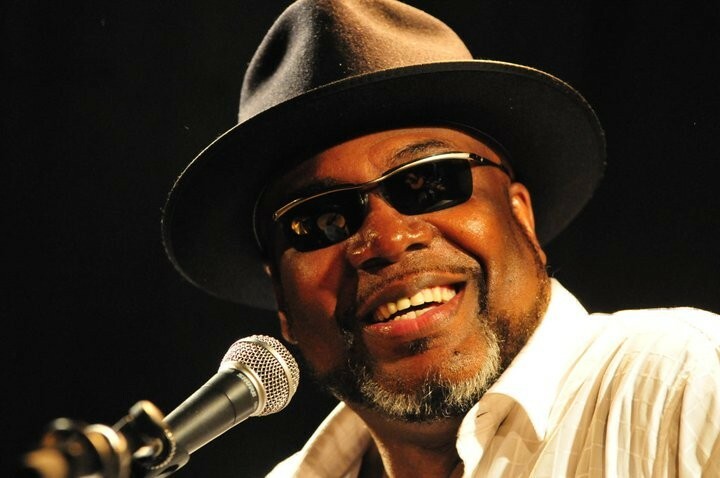 And now there´s Big Daddy Wilson, an American singer and songwriter who found his home in northern Germany. But something is different regarding Big Daddy Wilson. When he came over from the U.S. there was no blues in his baggage. He initially discovered the blues here in Germany which is where he will begin his international career. With his international solo debut on RUF Records Big Daddy Wilson is going to take one step further in his late career as a musician. For "Love Is The Key" he recorded his own songs exclusively with a small band; taking it back to the roots, often reduced to acoustic instruments, but always full of soul. You can listen to his very first song here, Anna, the song about his wife. Gospel is the foundation for "Keep Your Faith In Jah", but this doesn’t keep the songwriter Wilson from praising the talents of a gypsy queen from New Orleans, “Jazzy Rose“. In “Hard Days Work“, Big Daddy uses monotone drones for hypnotic effects on the listener, while breezy off beats Jamaica-style let “Dreaming“ to swing along. Autobiographic aspects can be found elsewhere: “Ain´t No Slave“ reminds us of the African-American history and at the same time makes us aware of Wilson’s grown confidence. His good friend Eric Bibb guests on two songs about Wilson’s roots ,”Country Boy” , “Walk A Mile In My Shoes”. He’s very proud of Bibb´s presence because “I’ve learnt so much from him,” says Wilson. The fruits of this learning can be tasted on Big Daddy’s imminent European Tour. Does he dare to imagine that he could take this music all the way back to his roots in North Carolina?